STANFORD, Calif. -- Mike Hopkins decided not to show his Washington players any video from their ugly loss at California that began a tough Bay Area trip. No need -- everybody knew. "Sometimes you've just got to survive and advance, forget it and have a short-term memory," Hopkins said, "crumble the paper and throw it away and it never happened." Jaylen Nowell scored 13 points but missed the front end of a 1-and-1 during a nervous finish for No. 25 Washington, which still held off Stanford 62-61 on Sunday for a weekend road split. "The reality of it is, it's not the end of the world," Hopkins said. "We didn't lose the game in the last possession we had there," da Silva said. "Too many turnovers, I would say." Washington had won 15 of 16 games before the loss in Berkeley but still wound up the outright Pac-12 regular-season champion when both Oregon State and Arizona State lost. The Huskies delayed their celebration until Saturday night. Washington's David Crisp scored seven points on 2-of-8 shooting after a career-high 32 points at Cal, his second career 30-point performance, in which he matched his career best with five 3s. 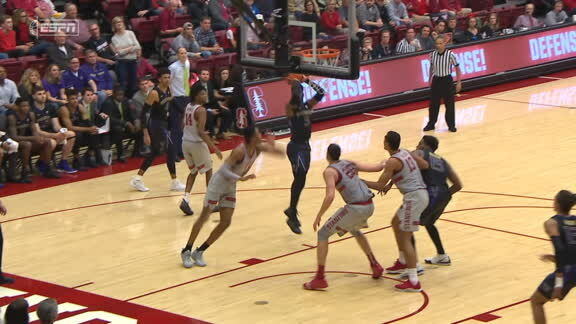 Both teams went cold late in the first half -- each team going 1 for 10 during a spurt -- and the Cardinal didn't score over the final 5:15 of the first half in a game that attracted some 30 NBA scouts to see the 6-foot-9 sophomore Okpala and Washington's Thybulle and Nowell. "The team that played on Thursday wasn't us," Thybulle said. "There was no point in lingering or picking apart because that was nothing like what we try to do as a team or as individuals." Stanford starter Daejon Davis, the Cardinal's second-leading scorer at 11.8 points per game, sat out with a right foot injury sustained during Thursday's 98-50 win over Washington State. Coach Jerod Haase said his return this week against Cal "is a possibility." Washington: Washington also struggled from beyond the arc, going 6 of 17. ... The Huskies had allowed 100 total points the previous two games combined before giving up 76 to Cal but got defensive late against Stanford. ... Washington had been forcing 16.1 turnovers per game and pushed Stanford into 18. Stanford: Okpala missed two early free throws and wound up just 2 of 8 from the line. ... Stanford is 1-17 vs. AP ranked opponents under third-year coach Haase -- beating No. 16 Arizona State on Jan. 17 last year -- and Haase is 3-25 all-time against ranked teams in seven seasons as a head coach overall. ... The Cardinal dropped to 10-3 at home. ... Stanford's new "Tree" mascot shook her branches after being crowned following the final buzzer after a rigorous two-week tryout. Her name is Caroline Kushel, a Stanford sophomore studying earth systems with a focus on sustainable agriculture. Washington: Hosts Oregon State on Wednesday before wrapping up Pac-12 play at home against Oregon on Saturday. Stanford: Hosts Cal on Thursday night as the Cardinal conclude the regular season at home for the first time in five years. Jaylen Nowell splashes tough jumper to give Washington a 3-point lead late.